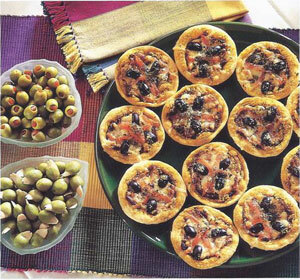 These tartlets, with their tangy Italian flavors, will serve 4people as a light lunch or supper dish, accompanied by a crisp green salad. They also make a tasty appetizer to serve with predinner drinks. They taste just as good cold as hot, so they can be prepared well in advance. Make the pastry: put the flour in a bowl, add the butter and rub in with the fingertips. Add enough water to bind to a soft dough. Cover with plastic wrap and chill for 30 minutes. Spread the red pesto in the tartlet shells, then fi II the shells with the tomato, garlic, black olives, and Fontina cheese. Sprinkle the grated Parmesan cheese over the tartlets, covering the pastry edges as well as the filling. Sprinkle the dried oregano on top. Bake the tartlets in a 400癋 (200癈) oven for 20-30 minutes, until the edges of the tartlets are golden brown in color and the Parmesan cheese topping has melted and become crispy. Serve the tartlets warm or cold. 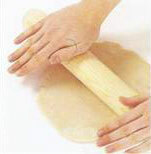 Sprinkle a work surface with flour, then roll out the short crust pastry to a 1/8-1/4 in (3-5 mm) thickness. 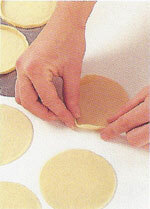 Cut out 12 rounds from the pastry, using a 4-in (lO-cm) pastry cutter. 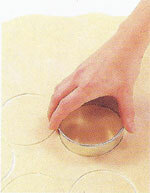 Fold up the edges of the rounds to form rims; put on a baking sheet. Make the short crust pastry shell and the filling as directed, using t/s lb (125 g) chopped pancetta instead of the bacon. Add 1 cup (60 g) drained and coarsely chopped sun-dried tomatoes in oil after cooking the pancetta and onion, and cook for 1 minute. Proceed as directed. Zmodo PKD-DK4216-500GB 4 Channel CCTV. The PKD-DK4216-500GB kit includes a 4 CH H.264 standalone DVR with 500GB HD and four outdoor security cameras providing everything you need to have.